← Susan Hutchison: Washington State’s Sarah Palin? One thing I learned not long after finishing my Spanish degree was — never volunteer to translate anything into a language you don’t dream in. I was visiting Flores, Guatemala, and offered to help a small art collective. In response, they handed me some fliers to translate from English to Spanish. I had that four year degree, you know, so I did — with embarrassing results. My sentences were grammatically correct, and the words even meant what I thought they meant. But no native speaker ever would have said things quite that way, and someone had to tactfully tell me so. I still wince at the memory, at my own naiveté and hubris. Takeaway for political candidates: If you’re not a Christian, don’t even try to speak Evangelese. There are subtleties of sequence and jargon that are invisible to outsiders, but violating them even slightly is a dead giveaway that you are a sham. Refer to someone as "a good person," for example, and it’s all over. You might as well be that poor American spy who shifted his fork to his right hand after cutting the meat. 1. Would I have thought to invoke the frightening words "age of the activist atheists," knowing that atheists are more reviled than gays and Muslims? 2. Would I have described sharing my religious beliefs as "giving a little testimony?" 3. Would I have said Richard Dawkins reacted to "the name of Jesus" (At the Name of Jesus ever knee shall bow . . . ) rather than the whole dismaying event? 4. Would it have occurred to me that one could be a confirmed Lutheran but not be a Christian until a specific born again experience? 5. Would I have known to tell a story about God telling me or another person to do something — with wonderful results? 7. 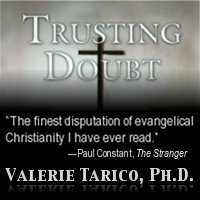 Would I have honed in on belief as the center of Christianity, with doubt as something to be prayed away? "I believe, help me in my unbelief." 8. Would I have called the Bible "the Word of God"? 10. Would I have avoided the word religion throughout my talk? If you didn’t know these were insider language and narrative templates , you’re not an insider. Susan Hutchison is the Real Deal, which is virtually impossible to fake. All the same, if you want the Evangelical/born again forty-ish percent of the public to find you appealing, there are a few turns of phrase that are worth incorporating into your campaign vocabulary. Don’t try using these to establish your spiritual bona fides. (Unless you are born again, you have none. See good person, above. There is no such thing. All we like sheep have gone astray.) Instead, use evangelical or biblical turns of phrase in a secular context. They will sound appealingly familiar to a born again audience–without you pretending to be something you aren’t. For example, here are a few sample phrases you might borrow from Hutchison. a. Evangelical examples: asking Jesus into your heart, God is speaking to your heart. b. Secular use: I feel in my heart, I know in my heart no matter how hard it may be, we need to provide basic medical care for every child in this country. 2. Say you felt "called" or were led to do something. a. Evangelical examples: God called me to move to Seattle, to take up the ministry, to put John 3:16 on my eyeblacks. Richard Dawkins and I have been brought together. b. Secular use: I felt called to take up the cause of health care for all. 3. Use the word "personal" liberally. a. Evangelical example: I needed a personal faith. You aren’t really a Christian until you have a personal relationship with Jesus. b. Secular use: I have a personal relationship to the people in that nursing home. 4. Use the phrase "all the world." a. Evangelical example: Go into all the world and preach the gospel to every creature. b. Secular use: Whether we treat health care as a basic human right will have ripple effects flow into all the world. 5. Talk about events that "changed your life forever." a. Evangelical example: Accepting Jesus as my personal savior changed my life forever. b. Secular use: Sitting with that dying child changed my life forever. Hutchison herself makes a mistake or two about insider/outsider language in her story about Richard Dawkins at Windsor Castle. In her version, he asks a question and she gives a little testimony about God revealing himself through Jesus. (Tangentially, Dawkins recalls the conversation being about GW, not Jesus.) In the story, Dawkins says that his books give people permission to "deny their faith." This is a very Evangelical turn of phrase. Also, Hutchison quotes Dawkins as saying she became "tawdry and base" when she said "the word Jesus". Unlikely. An atheist scientist is more likely to react negatively to her whole plug for special (biblical) revelation rather than the "name of Jesus," but in fundamentalist theology it is "the name of Jesus" that demons can’t bear. Most likely, Hutchison projected an Evangelical phrase into Dawkins’ mouth. Like my attempt to translate into Spanish, her attempt at translation probably was shaped by her native tongue. It’s easy go awry when you’re trying to speak someone else’s language, and secular folks frequently make mistakes when trying to build bridges with Evangelical believers. Here are a few examples of seemingly insider words that instead are actually negative triggers for many Evangelicals. 1. Calling Christianity a religion. It isn’t. It’s a relationship. 2. Referring to Jesus as a good man. He wasn’t. He was God. 3. Using the word "tolerance." It’s a bad word that means you are a moral relativist. 4. Mentioning priests or bishops. Way too Catholic. Evangelicals call them ministers or pastors or preachers. 5. Using the words interfaith, or spirituality. Those are words for wusses and imply spiritual weakness. If you want to get serious about understanding Evangelical language and the role it plays in politics, I recommend David Domke’s book, The God Strategy. You also can find funny or serious lists of insider language online. But I want to make a more important point. For those of you who watched the video, take a cue from Hutchison’s grace, poise, and relentless equanimity. Mean spirited jabs, visible frustration or righteous indignation rarely rallies people to your side. Susan Hutchison talks about the enemies of her God–Dan Barker, activist atheists, and Richard Dawkins– with zero verbal edge, all the while maintaining the same smile that is there when she talks about God answering prayers. It’s what made her well loved as an anchor woman, and it may very well win her an election among people who actually disagree with her core values. In the end, the biggest part of people feeling connected with you is whether you come across as likeable. That is what all of the insider/outsider language analysis really is about. If people identify with you and find you trustworthy–if thinking about you makes them feel warm and happy–they’re going to put their own best spin on whatever you may say.